It is nice to walk into your local comic shop and pick up your new books on Wednesday. It is even better when the books are selling for several times cover price in the next couple of hours. Avengers #676 is one of those books. 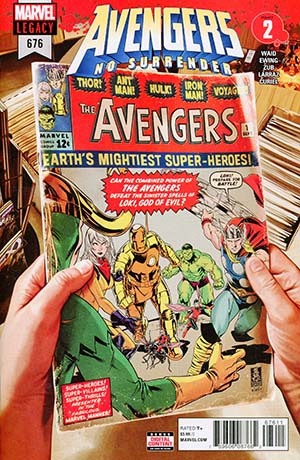 Avengers #676 is currently selling in the $13-$15 range, it was selling for around $25 yesterday. The new character Voyager makes an appearance in the book. She previously appeared on the Avengers #675 McKone Variant , Avengers #675 Party Variant and Avengers #675 Party Sketch Variant . She also appears in statue form on the Alex Ross 1:100 Variant . Jim Sub will be in town next week signing and I have 10 copies waiting for him. Her 1st cover appearance is the Captain America #697 Cassaday Avengers variant. That came out on 1/3. Agentpoyo tell that to all the gwenpool fans. Shhhhh…. Nobody is suppose to know. So who just bought at least one copy of Captain America 697? Lol! I bought cover A…. Don’t judge… Brubaker and Remender forced me to be on the Cap bandwagon…. Hes one of my favorite characters now in Marvel la la land. Haven’t read a Captain America issue since they did the Marvel Now! run. Yeah. I thought about the sentry too. Especially with the colors. There could. E something to it. Always a victory to get the Wednesday winner. Just wish I would have picked up a couple more copies. Definitely should have grabbed more than one! Cover of the week; seems like it was underordered. Called a LCS and got 2 on hold. Will be picking them up shortly. Anyone have an extra Avengers 676 they would be willing to sell or trade? I have 10 being signed by Jim Zub available next Saturday. Maybe more. If you don’t want it signed, let me know. I have two listed but have another one I’m willing to let go possibly. Previous Previous post: Did Amazon Just Spoil Amazing Spider-Man Red Goblin Storyline?